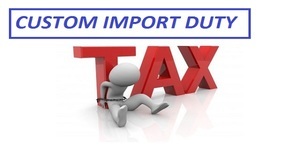 Custom duty is a form of indirect tax that is levied on imports in India from anywhere across the world. It is levied on all kind of products and goods that are imported in India with an exception of goods like Beverages, Spirits and Vinegar, equipment, fertilizers, food grains, Fruits, Miscellaneous Grains etc. Indian Custom import duty is levied as per the quantity of goods or on ad valorem basis that is value, dimensions, weight or any other criteria for the goods in question.